Homework - Home work will be set every Friday and needs to be returned by Wednesday of the following week. Home work will include phonics and number work. Reading - All children will be heard at least 3 times a week. Reading bags go home every night and are to be returned every morning. Please hear your child read as often as possible and sign the Reading Record book. Thank you. Nursery enjoyed having a Easter hunt, We found all the eggs that the Easter Bunny had left! Every Thursday night some of reception do the 'fun and games' after school club. We have so much fun, this will be continuing next term. EYFS loved listening to the story teller, Tara Tickle. We had so much fun for red nose day! Everyone looked great for world book day. We all enjoyed pancake day! We loved making our aliens using clay in forest school. Nursery had loads of fun celebrating Chinese new year and doing the dragon dance! Nursery love doing helicopter stories. EYFS had a lovely time at the multi sports event. Nursery enjoyed making rockets using different materials for this terms topic, SPACE! Thank you all parents who came to our Christmas Craft afternoon! Nursery and Reception loved their Christmas Party! We played lots of games and danced away to our favourite songs! We also had a visit from Santa! On Friday 14th December we had our annual wear something Christmassy day and our Festive lunch. We had a great day! Yesterday Reception went to see Santa! It was truly magical! We found the missing jigsaw pieces, had toasted marshmallows around the campfire, made a decoration for our trees and met the man himself...Santa! Reception had a visit from Felling Library last week. They met a very friendly bear and enjoyed lots of bear hugs! Nursery have been making their own Gingerbread houses. We have been enjoying Forest School this term, cooking on the camp fire and playing in our mud kitchen! We love getting muddy and wet!! Please keep checking our page to follow the exciting things we are getting up to! We celebrated Eid with a dance workshop. We had fun at the farm. Our topic for our first summer half term is growing and the farm. Our first story this half term is Jack and the Beanstalk. Our topic this half term is jungle animals. World Book day...look at our fantastic costumes! We had a great time celebrating Chinese New Year in School. Reception had a special visitor to teach them all about the Chinese New Year story and Nursery made a dragon and did a dragon dance. Our topic this half term will be Dinosaurs! Happy New Year and welcome back to school. We will be learning all about dinosaurs this half term and will be digging for bones and fossils, making our own dinosaur skeletons and joining in with lots of exciting dinosaur themed activities. Reception and some of Nursery had a great time visiting Santa Yesterday! We made Santa hats, baubles for our Christmas Trees, jigsaws and hot hot chocolate and marshmallows around the camp fire. Finally we met the main man himself...Santa!!! It was a magical morning!! Have a look at the pictures below! We had a brilliant Halloween Day in our Forest School. We all had a try of Pumpkin soup and some of us really enjoyed it, we also had some witches brew!!! We enjoyed making mud Spiders and going on a treasure hunt looking for delicious treats. Have a look at the pictures below...don't be too scared with our Halloween costumes! Reception have enjoyed their first visit to our Forest School!! We went on a Scavenger Hunt to see what we could find! We have recently been on a walk around our local area. We found lots of interesting things. We also went to ASDA to buy some biscuits to have with our milk as a special treat. Every week we are exploring our outdoors through Forest School. We are having an amazing time finding lots of interesting creatures and objects and talking and listening to our friends. We have even made hot chocolate and bread around the camp fire - Mrs Reid was proud because we all had a try. "This is really fun" a child commented during Forest School. We have begun to make our very own Bug Hotel ... What do you think of it so far? 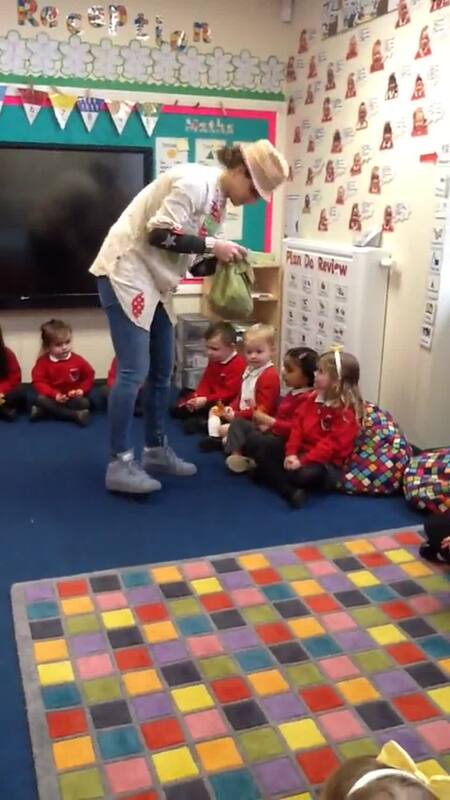 At Christmas time the children enjoyed a Christmas party where they had a special visitor. All children received a special gift from Santa. We were very lucky to have a class trip to Beamish Museum to visit Santa and feed the reindeer.